On this website we frequently deal with very intricate apologetical issues relating to Protestantism; the proper understanding of the Greek in the phrase "works of the law" used by St. Paul; specific rebuttals to accusations that Catholics believe the Virgin Mary died for our sins; a defense of the concept of Apostolic Succession against attacks that the teaching is contrary to St. Paul's complaints about disciples boasting that they are from Paul or Apollos. Sometimes the focus of our articles presuppose that our readership already possesses advanced knowledge of the points of dispute between Catholics and Protestants. Today, let us go back to basics and examine a very fundamental obstacle to Protestant reunion with the Church: the issue of Marian devotion in Catholic spirituality. For many Protestants, every other Catholic teaching can be accepted with the proper education and the working of grace. But aversion to the Catholic veneration of Mary is so strongly ingrained in Protestant tradition as to be extremely difficult to overcome for some Protestants, even when they positively will to join the Catholic Church. If you are Catholic, you know that the title of this is a loaded question. If we mean "is the liturgical commemoration of All Saints' Day upon which Halloween is based pagan? ", the answer is an obvious and resounding no. But if we mean "is the modern popular celebration of Halloween, with its twofold focus on consuming immoderate amounts of sugared sweets and glorifying everything bizarre and dark, a reflection of pagan sentiment? ", then I think we could answer in the affirmative. Even if there is no historical connection between Halloween celebrations and pre-Christian paganism, the mass-marketed "Halloween" is certainly a manifestation of neo-pagan modernism. Read more: Is Halloween Pagan? In their attempts to discredit Catholic veneration of the Blessed Virgin Mary and demonstrate that Mary takes the place of Jesus in Catholic piety, Protestants have sometimes made the assertion that different Catholic shrines around the world depict Mary as crucified for the sins of mankind, essentially sending the message that Mary, not Jesus, is the Savior of the world. This accusation appears in the popular evangelical book Fast Facts on False Teachings by Ron Carlson and Ed Decker (2003), where the authors speak of an altar in the Cathedral of Quito, Ecuador, that features an altar with a crucified statue of Mary above it. The same accusation is made in the video Catholicism: Crisis of Faith by Lumen Productions, an anti-Catholic video produced by disgruntled ex-Catholics. The implication is that Catholics believe they owe their salvation to Mary, not Jesus. Read more: Virgin Mary Crucified? It is not the concept of an Assumption that is so problematic - Protestants of course acknowledge that both Enoch and Elijah were assumed alive into heaven, as the Scriptures state. The problem is not with the concept of an assumption, as much as whether or not one specific individual - Our Lady - was in fact assumed body and soul into heaven. St. James and St. Paul on "Works of the Law"
In any discussion with Protestants about how we are saved, the Catholic who insists on the reality of merit and the efficacy of good works done in grace will inevitably be countered by biblical passages that seem to indicate that our salvation is not contingent upon anything we do. What are the relevant biblical passages in this debate, and what is their true meaning? In James 2:24, St. James clearly says, “Man is justified by works and not by faith alone" (the only time the phrase "faith alone" appears in the Bible). For a Catholic, this could not be more clear. Yet Protestants will typically counter by turning to St. Paul's discussion of justification in Romans, specifically Romans 3:28, where St. Paul says precisely the opposite of St. James: "We hold that man is justified by faith apart from works of law." What is the solution here? Read more: St. James and St. Paul on "Works of the Law"
This spring, Protestant pastor Rob Bell of Grand Rapids, MI. published a controversial book entitled Love Wins: A Book About Heaven, Hell and the Fate of Every Person that caused controversy to erupt throughout the evangelical Protestant world. The book basically presents a Protestant version of the heretical Balthasarian doctrine on hell - that in the end, we can expect or at least hope for a universal salvation of every human. He asserts that hell is simply what we created for ourselves by rejecting the will of God, but does not see it as an objective state of a damned soul in eternal separation from God. This book has prompted everything from blog responses by irritated evangelicals (here) to formal critiques in Christianity Today (see here) to television interviews (here and here). 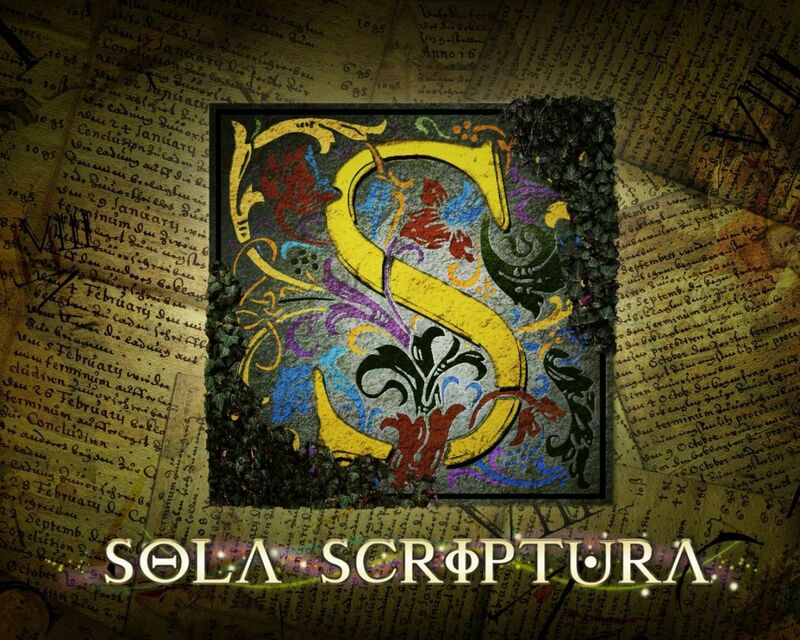 Read more: Did St. Augustine believe in Sola Scriptura?